Buried Saint-Sauveur, Blois. Reburied at Saint-Denis in 1610. Catherine de' Medici (April 13, 1519 – January 5, 1589) was born in Florence, Italy, as Caterina Maria Romula di Lorenzo de' Medici. Her parents, Lorenzo II de' Medici, Duke of Urbino, and Madeleine de la Tour d'Auvergne, Countess of Boulogne, both died within weeks of her birth. In 1533, at the age of 14, Caterina married Henry, second son of King Francis I of France and Queen Claude. Under the gallicized version of her name, Catherine de Médicis, she was queen consort of King Henry II of France from 1547 to 1559. Throughout Henry II's reign, he excluded Catherine from influence and instead showered favors on his mistress, Diane de Poitiers. Henry's death in 1559 thrust Catherine into the political arena as mother of the frail 15-year-old King Francis II. When he too died in 1560, she was appointed regent on behalf of her ten-year-old son King Charles IX and was granted sweeping powers. After Charles died in 1574, Catherine played a key role in the reign of her third son, Henry III. He dispensed with her advice only in the last months of her life. Catherine's three weak sons reigned in an age of almost constant civil and religious war in France. The problems facing the monarchy were complex and daunting. At first, Catherine compromised and made concessions to the rebelling Protestants, or Huguenots, as they became known. She failed, however, to grasp the theological issues that drove their movement. Later, she resorted in frustration and anger to hard-line policies against them. As a result, she was blamed for all the faults of the régime, in particular for the St. Bartholomew's Day massacre of 1572, in which thousands of Huguenots were killed in Paris and throughout France. According to a contemporary chronicler, when Catherine de' Medici was born in Florence on Wednesday, April 23, 1519, at exactly 5:04 in the morning, her parents, were "as pleased as if it had been a boy". Their pleasure, however, was short-lived. Catherine's mother, Madeleine de la Tour d'Auvergne, Countess of Boulogne, died on April 28, at the age of 17. Catherine's father, Lorenzo II de' Medici, Duke of Urbino, died on May 4, probably from syphilis. The young couple had been married the year before at Amboise as part of the alliance between King Francis I of France and Lorenzo's uncle Pope Leo X against the Holy Roman Emperor Maximilian I. King Francis now asked for Catherine to be raised at the French court, but Pope Leo had other plans for her. He intended to marry her to his brother's illegitimate son, Ippolito de' Medici, and set the pair up as rulers of Florence. Catherine was first cared for by her grandmother, Alfonsina Orsini. After Alfonsina died in 1520, Catherine was brought up with her cousins by her aunt, Clarissa Strozzi. The death of Pope Leo in 1521 interrupted Medici power briefly, until Cardinal Giulio de' Medici was elected Pope Clement VII in 1523. Clement housed Catherine in the Palazzo Medici in Florence, where she lived in state. The Florentine people called her "duchessina", the little duchess. In 1527, the Medici were overthrown in Florence by a faction opposed to the regime of Clement's representative, Cardinal Passerini, and Catherine was taken hostage and placed in a series of convents. Clement had no choice but to crown Charles as Holy Roman Emperor in return for his help in retaking the city. In October 1529, Charles's troops laid siege to Florence. As the siege dragged on, voices called for Catherine to be killed and exposed on the city walls. Soldiers made her ride through the streets on a donkey, jeered by an angry crowd. The city finally surrendered on August 12, 1530. Clement called Catherine to Rome and greeted her with open arms and tears in his eyes. Then he set about the business of finding her a husband. On her visit to Rome, the Venetian envoy described her as "small of stature, and thin, and without delicate features, but having the protruding eyes peculiar to the Medici family". Suitors, however, lined up for her hand; and when in early 1531 Francis I of France proposed his second son, Henry, Duke of Orléans, Clement jumped at the offer. Henry was a prize catch for Catherine, who despite her wealth was a commoner. The wedding, a grand affair marked by extravagant display and gift-giving, took place in Marseille on October 28, 1533. Prince Henry danced and jousted for Catherine. The 14-year-old couple left their wedding ball at midnight to perform their nuptial duties. Henry arrived in the bedroom with King Francis, who is said to have stayed until the marriage was consummated. He noted that "each had shown valour in the joust". Clement visited the newlyweds in bed the next morning and added his blessings to the night's proceedings. Prince Henry showed no interest in Catherine as a wife; instead, he openly took mistresses. For the first ten years of the marriage, Catherine failed to produce any children. In 1537, on the other hand, Philippa Duci, one of Henry's mistresses, gave birth to a daughter, whom he publicly acknowledged. This proved that Henry was virile and added to the pressure on Catherine to produce a child. In 1536, Henry's older brother, François, caught a chill after a game of tennis, contracted a fever, and died. As Dauphine, Catherine was now expected to provide a future heir to the throne. According to the court chronicler Brantôme, "many people advised the king and the Dauphin to repudiate her, since it was necessary to continue the line of France." Divorce was discussed. In desperation, Catherine tried every known trick for getting pregnant, such as placing cow dung and ground stags' antlers on her "source of life," and drinking mule's urine. On January 20, 1544, she at last gave birth to a son, named after King Francis. The old king greeted the news with tears of joy. After becoming pregnant once, Catherine had no trouble doing so again. She may have owed her change of luck to a doctor called Jean Fernel, who had noticed slight abnormalities in the couple's sexual organs and advised them how to solve the problem. Catherine went on to bear Henry a further nine children, six of whom survived infancy, including the future Charles IX (born June 27, 1550); the future Henry III (born September 19, 1551); and François (born March 18, 1555). The long-term future of the Valois dynasty, which had ruled France since the fourteenth century, seemed assured. Catherine's new-found ability to bear children, however, failed to improve her marriage. In 1538, at the age of 19, Henry had taken as his mistress the 38-year-old Diane de Poitiers, whom he adored for the rest of his life. Even so, he respected Catherine's status as his consort. When King Francis I died in 1547, therefore, Catherine duly became queen consort of France. She was crowned in the basilica of Saint-Denis in June 1549. Catherine de' Medici, as Queen of France. "Her mouth is too large and her eyes too prominent and colorless for beauty," wrote a Venetian envoy as Catherine approached 40, "but a very distinguished-looking woman, with a shapely figure, a beautiful skin and exquisitely shaped hands". Henry allowed Catherine almost no political influence as queen. Although she sometimes acted as regent during his absences from France, her powers were strictly nominal. Henry gave the Château of Chenonceau, which Catherine had wanted for herself, to Diane de Poitiers, who took her place at the center of power, dispensing patronage and accepting favors. The imperial ambassador reported that in the presence of guests, Henry would sit on Diane's lap and play the guitar, chat about politics, or fondle her breasts. Diane never regarded Catherine as a threat. She even encouraged the king to sleep with her and father more children. In 1556, Catherine nearly died giving birth to twin daughters. Surgeons saved her life by breaking the legs of one of the two babies, who died in her womb. The surviving daughter died seven weeks later. Catherine had no more children. On April 3–4, 1559, Henry signed the Peace of Cateau-Cambrésis with the Holy Roman Empire and England, ending a long period of Italian wars. The treaty was sealed by the betrothal of Catherine's 13-year-old daughter Elisabeth to Philip II of Spain. Their proxy wedding in Paris on June 22, 1559 was celebrated with festivities, balls, masques, and five days of jousting. King Henry took part in the jousting, sporting Diane's black-and-white colors. He defeated the dukes of Nemours and Guise, but the young Gabriel, Comte de Montgomery, knocked him half out of the saddle. Henry insisted on riding against Montgomery again, and this time, Montgomery's lance shattered into the king's face. Henry reeled out of the clash, his face pouring blood, with splinters "of a good bigness" sticking out of his eye and head. Catherine, Diane, and Prince Francis all fainted. Henry was carried to the Château de Tournelles, where five splinters of wood were extracted from his head, one of which had pierced his eye and brain. Catherine stayed by his bedside, but Diane kept away, "for fear," in the words of a chronicler, "of being expelled by the Queen". For the next ten days, Henry's state fluctuated. At times he even felt well enough to dictate letters and listen to music. Slowly, however, he lost his sight, speech, and reason, and on July 10, 1557 he died. From that day, Catherine took a broken lance as her emblem, inscribed with the words "lacrymae hinc, hinc dolor" ("from this come my tears and my pain"), and wore black mourning in memory of Henry. Francis II of France, by François Clouet, 1560. Francis II found the crown so heavy at his coronation that four nobles had to hold it in place as he walked up the steps to his throne. Francis II became king at the age of 15. In what has been called a coup d'état, the Cardinal of Lorraine and the Duke of Guise—whose niece, Mary, Queen of Scots, had married Francis the year before—seized power the day after Henry II's death and quickly moved themselves into the Louvre with the young couple. The English ambassador reported a few days later that "the house of Guise ruleth and doth all about the French king". For the moment, Catherine worked with the Guises out of necessity. She was not strictly entitled to a role in Francis's government, because he was deemed old enough to rule for himself. Nevertheless, all his official acts began with the words: "This being the good pleasure of the Queen, my lady-mother, and I also approving of every opinion that she holdeth, am content and command that …." Catherine did not hesitate to exploit her new authority. One of her first acts was to force Diane de Poitiers to hand over the crown jewels and return Chenonceau to the crown. She later did her best to efface or outdo Diane's building work at Chenonceau. The Guise brothers set about persecuting the Protestants with zeal. Catherine adopted a moderate stance and spoke up against the Guise persecutions, though she had no particular sympathy for the Huguenots, whose cause she never fully understood. The Protestants looked for leadership first to Antoine de Bourbon, King-consort of Navarre, the First Prince of the Blood, and then, with more success, to his brother, Louis I de Bourbon, Prince de Condé, who backed a plot to overthrow the Guises by force. When the Guises heard of the plot, they moved the court to the fortified Château of Amboise. The Duke of Guise launched an attack into the woods around the château. His troops surprised the rebels and killed many of them on the spot, including the commander, La Renaudie. Others they drowned in the river or strung up around the battlements while Catherine and the court watched. In June 1560, Michel de l'Hôpital was appointed Chancellor of France. He sought the support of France's constitutional bodies and worked closely with Catherine to defend the law in the face of the growing anarchy. Neither saw the need to punish Protestants who worshipped in private and did not take up arms. On August 20, 1560, Catherine and the chancellor advocated this policy to an assembly of notables at Fontainebleau. Historians regard the occasion as an early example of Catherine's statesmanship. Meanwhile, Condé raised an army and in autumn 1560 began attacking towns in the south. Catherine ordered him to court and had him imprisoned as soon as he arrived. He was tried in November, found guilty of offenses against the crown, and sentenced to execution. His life was saved by the illness and death of the king, as a result of an infection or an abscess in his ear. When Catherine had realized Francis was going to die, she made a pact with Antoine de Bourbon by which he would renounce his right to the regency of the future king, Charles IX, in return for the release of his brother, Condé. 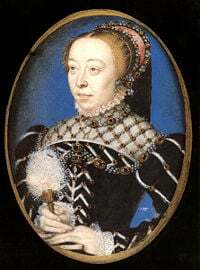 As a result, when Francis died on December 5, 1560, the Privy Council appointed Catherine as governor of France (gouvernante de France), with sweeping powers. She wrote to her daughter Elisabeth: "My principal aim is to have the honour of God before my eyes in all things and to preserve my authority, not for myself, but for the conservation of this kingdom and for the good of all your brothers". Charles IX of France, after François Clouet, c. 1565. The Venetian ambassador Giovanni Michiel described Charles as "an admirable child, with fine eyes, gracious movements, though he is not robust. He favors physical exercise that is too violent for his health, for he suffers from shortness of breath". At first Catherine kept the nine-year-old king, who cried at his coronation, close to her, and slept in his chamber. She presided over his council, decided policy, and controlled state business and patronage. However, she was never in a position to control the country as a whole, which was on the brink of civil war. In many parts of France the rule of nobles held sway rather than that of the crown. The challenges Catherine faced were complex and in some ways difficult for her to understand. She summoned church leaders from both sides to attempt to solve their doctrinal differences. Despite her optimism, the resulting Colloquy of Poissy ended in failure on October 13, 1561, dissolving itself without her permission. Catherine failed because she saw the religious divide only in political terms. In the words of historian R. J. Knecht, "she underestimated the strength of religious conviction, imagining that all would be well if only she could get the party leaders to agree." In January 1562, Catherine issued the tolerant Edict of Saint-Germain in a further attempt to build bridges with the Protestants. On March 1, 1562, however, in an incident known as the Massacre at Vassy, the Duke of Guise and his men attacked worshipping Huguenots in a barn at Vassy, killing 74 and wounding 104. Guise, who called the massacre "a regrettable accident," was cheered as a hero in the streets of Paris while the Huguenots called for revenge. The massacre lit the fuse that sparked the French Wars of Religion. For the next 30 years, France found itself in a state of either civil war or armed truce. Within a month Prince Louis de Condé and Admiral Gaspard de Coligny had raised an army of 1800. They formed an alliance with England and seized town after town in France. Catherine met Coligny, but he refused to back down. She therefore told him: "Since you rely on your forces, we will show you ours". The royal army struck back quickly and laid siege to Huguenot-held Rouen. Catherine visited the deathbed of Antoine de Bourbon, King of Navarre, after he was fatally wounded by an arquebus shot. Catherine insisted on visiting the field herself and when warned of the dangers laughed, "My courage is as great as yours". The Catholics took Rouen, but their triumph was short lived. On February 18, 1563, a spy called Poltrot de Méré fired an arquebus into the back of the Duke of Guise, at the siege of Orléans. The murder triggered an aristocratic blood feud that complicated the French civil wars for years to come, Catherine was delighted with the death of her ally. "If Monsieur de Guise had perished sooner," she told the Venetian ambassador, "peace would have been achieved more quickly". On March 19, 1563, the Edict of Amboise, also known as the Edict of Pacification, ended the war. Catherine now rallied both Huguenot and Catholic forces to retake Le Havre from the English. On August 17, 1563, Charles IX was declared of age at the Parlement of Rouen, but he was never able to rule on his own and showed little interest in government. Catherine decided to launch a drive to enforce the Edict of Amboise and revive loyalty to the crown. To this end, she set out with Charles and the court on a progress around France that lasted from January 1564 until May 1565. Catherine held talks with the Protestant Queen Jeanne d'Albret of Navarre at Mâcon and Nérac. She also met her daughter Queen Elisabeth of Spain at Bayonne near the Spanish border, amidst lavish court festivals. Philip II excused himself from the occasion. He sent the Duke of Alba to tell Catherine to scrap the Edict of Amboise and to use punitive solutions to solve the problem of heresy. On September 27, 1567, in a swoop known as the Surprise of Meaux, Huguenot forces attempted to ambush the king, triggering renewed civil war. Taken unawares, the court fled to Paris in disarray. The war was ended by the Peace of Longjumeau of March 22–23, 1568, but civil unrest and bloodshed continued. The Surprise of Meaux marked a turning point in Catherine's policy towards the Huguenots. From that moment, she abandoned compromise for a policy of repression. She told the Venetian ambassador in June 1568 that all one could expect from Huguenots was deceit, and she praised the Duke of Alba's reign of terror in the Netherlands, where Calvinists and rebels were put to death in the thousands. Jeanne d'Albret, Queen of Navarre, by François Clouet, 1570. She wrote to her son, Henry, in 1572: "All she [Catherine] does is mock me, and afterwards tells others exactly the opposite of what I have said … she denies everything, laughing in my face … she treats me so shamefully that the patience I manage to maintain surpasses that of Griselda". The Huguenots retreated to the fortified stronghold of La Rochelle on the west coast, where Jeanne d'Albret, and her 15-year-old son Henry of Bourbon, joined them. "We have come to the determination to die, all of us," Jeanne d'Albret wrote to Catherine, "rather than abandon our God, and our religion". Catherine called Jeanne, whose decision to rebel posed a dynastic threat to the Valois, "the most shameless woman in the world." Nevertheless, the Peace of Saint-Germain-en-Laye, signed on August 8, 1570 because the royal army ran out of cash, conceded wider toleration to the Huguenots than ever before. Catherine looked to further Valois interests by grand dynastic marriages. In 1570, Charles IX married Elisabeth of Austria, daughter of the Maximilian II, Holy Roman Emperor. Catherine was also eager for a match between one of her two youngest sons and Elizabeth of England. After Catherine's daughter Elisabeth died in childbirth in 1568, she had touted her youngest daughter Marguerite as a bride for Philip II of Spain. Now she sought a marriage between Marguerite and Henry of Navarre, with the aim of uniting Valois and Bourbon interests. Marguerite, however, was secretly involved with Henry of Guise, the son of the late Duke of Guise. When Catherine found this out, she had her daughter brought from her bed. Catherine and the king then beat her, ripping her nightclothes and pulling out handfuls of her hair. Catherine pressed Jeanne d'Albret to attend court. Writing that she wanted to see Jeanne's children, she promised not to harm them. Jeanne replied: "Pardon me if, reading that, I want to laugh, because you want to relieve me of a fear that I've never had. I've never thought that, as they say, you eat little children." When Jeanne did come to court, Catherine piled mental pressure on her, playing on Jeanne's hopes for her beloved son. Jeanne finally agreed to the marriage between her son and Marguerite, so long as Henry could remain a Huguenot. When Jeanne arrived in Paris to buy clothes for the wedding, she was taken ill and died, aged 44. Huguenot writers later accused Catherine of murdering her with poisoned gloves. The wedding took place on August 18, 1572 at Notre-Dame, Paris. The St. Bartholomew's Day massacre, which began two days later, has stained Catherine's reputation ever since. There is no reason to believe she was not party to the decision when on August 23 Charles IX ordered, "Then kill them all! Kill them all!" The thinking was clear. Catherine and her advisers expected a Huguenot uprising to revenge the attack on Coligny. They chose therefore to strike first and wipe out the Huguenot leaders while they were still in Paris after the wedding. The slaughter in Paris lasted for almost a week. It spread to many parts of France, where it persisted into the autumn. In the words of historian Jules Michelet, "St Bartholomew was not a day, but a season." The massacre delighted Roman Catholic Europe, and Catherine happily took the credit. On September 29, when Navarre knelt before the altar as a Roman Catholic, having converted to avoid being killed, Catherine turned to the ambassadors and laughed. From this time dates the "black legend" of the wicked Italian queen. Huguenot writers branded Catherine a scheming Italian, who had acted on Machiavelli's advice to kill all enemies in one blow. Two years later, Catherine faced a new crisis with the death of Charles IX at the age of 23. His dying words were "oh, my mother …." The day before he died, he named Catherine regent, since his brother and heir—the Duke of Anjou—was in Poland, where he had been elected king the year before. Catherine wrote to Henry: "I am grief-stricken to have witnessed such a scene and the love which he showed me at the end …. My only consolation is to see you here soon, as your kingdom requires, and in good health, for if I were to lose you, I would have myself buried alive with you". Henry was Catherine's favorite son. Unlike his brothers, he came to the throne as a grown man. He was also healthier than them, though he suffered from weak lungs and constant fatigue. His interest in the tasks of government, however, proved fitful. He depended on Catherine and her team of secretaries until the last few weeks of her life. He often hid from state affairs, immersing himself in acts of piety, such as pilgrimages and flagellation. Henry married Louise de Lorraine-Vaudémont in February 1575, two days after his coronation. His choice thwarted Catherine's plans for a political marriage to a foreign princess. Rumors of Henry's inability to produce children were by that time in wide circulation. The papal nuncio Salviati observed, "it is only with difficulty that we can imagine there will be offspring … physicians and those who know him well say that he has an extremely weak constitution and will not live long." As time passed and the likelihood of children from the marriage receded, Catherine's youngest son, François, Duke of Alençon, known as "Monsieur," played upon his role as heir to the throne, repeatedly exploiting the anarchy of the civil wars, which were by now as much about noble power struggles as religion. Catherine did all in her power to bring François back into the fold. On one occasion, in March 1578, she lectured him for six hours about his dangerously subversive behavior. In 1576, in a move that endangered Henry's throne, François allied with the Protestant princes against the crown. On May 6, 1576, Catherine gave in to almost all Huguenot demands in the Edict of Beaulieu. The treaty became known as the Peace of Monsieur because it was thought that François had forced it on the crown. François died of consumption in June 1584, after a disastrous intervention in the Low Countries during which his army had been massacred. Catherine wrote, the next day: "I am so wretched to live long enough to see so many people die before me, although I realize that God's will must be obeyed, that He owns everything, and that he lends us only for as long as He likes the children whom He gives us." The death of her youngest son was a calamity for Catherine's dynastic dreams. Under Salic law, by which only males could ascend the throne, the Huguenot Henry of Navarre now became heir presumptive to the French crown. Catherine's youngest son, François, Duke of Alençon, by Nicholas Hilliard, c. 1577. Elizabeth of England called him "her frog" but found him "not so deformed" as she had been led to expect. Catherine had at least taken the precaution of forcing Marguerite, her youngest daughter, into an arranged marriage to the king of Navarre, (Henri de Bourbon). Marguerite, however, became almost as much of a thorn in Catherine's side as François, and in 1582, she returned to the French court without her husband. Catherine was heard yelling at her for taking lovers. Catherine sent Pomponne de Bellièvre to Navarre to arrange Marguerite's return. In 1585, Marguerite fled Navarre again. She retreated to her property at Agen, in Southern France, and begged her mother for money. Catherine sent her only enough "to put food on her table". Moving on to the fortress of Carlat, Marguerite took a lover called d'Aubiac. Catherine asked Henry to act before Marguerite brought shame on them again. In October 1586, therefore, he had Marguerite locked up in the Château d'Usson. D'Aubiac was executed, though not, despite Catherine's wish, in front of Marguerite. Catherine cut Marguerite out of her will and never saw her again. Catherine was unable to control Henry in the way she had Francis and Charles. Her role in his government became that of chief executive and roving diplomat. She travelled widely across the kingdom, enforcing his authority and trying to head off war. In 1578, she took on the task of pacifying the south. At the age of 59, she embarked on an 18-month journey around the south of France to meet Huguenot leaders face to face. Her efforts won Catherine new respect from the French people. On her return to Paris in 1579, she was greeted outside the city by the Parlement and crowds. The Venetian ambassador, Gerolamo Lipomanno, wrote: "She is an indefatigable princess, born to tame and govern a people as unruly as the French: they now recognize her merits, her concern for unity and are sorry not to have appreciated her sooner." She was under no illusions, however. On November 25, 1579, she wrote to the king, "You are on the eve of a general revolt. Anyone who tells you differently is a liar." Many leading Roman Catholics were appalled by Catherine's attempts to appease the Huguenots. After the Edict of Beaulieu (May 6, 1576), they had started forming local leagues to protect their religion. The death of the heir to the throne in 1584 prompted the Duke of Guise to assume the leadership of the Catholic League. He planned to block Henry of Navarre's succession and place Henry's Catholic uncle Cardinal Charles de Bourbon on the throne instead. In this cause, he recruited the great Catholic princes, nobles and prelates, signed the treaty of Joinville with Spain, and prepared to make war on the "heretics." By 1585, Henry III had no choice but to go to war against the League. As Catherine put it, "peace is carried on a stick" (bâton porte paix). "Take care," she wrote to the king, "especially about your person. There is so much treachery about that I die of fear." Henry was unable to fight the Catholics and the Protestants at once, both of whom had stronger armies than his own. In the Treaty of Nemours, signed on July 7, 1585, he was forced to give in to all the League's demands, even that he pay its troops. He went into hiding to fast and pray, surrounded by a bodyguard known as "the Forty-five," and left Catherine to sort out the mess. The monarchy had lost control of the country, and was in no position to assist England in the face of the coming Spanish attack. The Spanish ambassador told Philip II that the abscess was about to burst. By 1587, the Roman Catholic backlash against the Protestants had become a campaign across Europe. Elizabeth I of England's execution of Mary, Queen of Scots, on February 18, 1587 outraged the Catholic world. Philip II of Spain prepared for an invasion of England. The League took control of much of northern France to secure French ports for his armada. Catherine de' Medici, by François Clouet. As a widow, Catherine wore a widow's cap or a French hood. At the back of her ruff stood a high black collar; and she wore a wide black shirt, pointed bodice, and enormous winged sleeves. "Over all this flowed a long black mantle". Henry hired Swiss mercenaries to help him defend himself in Paris. The Parisians, however, claimed the right to defend the city themselves. On May 12, 1588, they set up barricades in the streets and refused to take orders from anyone except the Duke of Guise. When Catherine tried to go to mass, she found her way barred, though she was allowed through the barricades. The chronicler L'Estoile reported that she cried all through her lunch that day. She wrote to Bellièvre, "Never have I seen myself in such trouble or with so little light by which to escape." As usual, Catherine advised the king, who had fled the city in the nick of time, to compromise and live to fight another day. On June 15, 1588, Henry duly signed the Act of Union, which gave in to all the League's latest demands. On September 8, 1588, at Blois, where the French court had assembled for a meeting of the Estates-General, Henry fired all his ministers without warning. Catherine, in bed with a lung infection, had been kept in the dark. The king's actions effectively ended her days of power. At the meeting of the Estates, Henry thanked Catherine for all she had done. He called her not only the mother of the king but the mother of the state. Henry did not tell Catherine of his plan for a solution to his problems. On December 23, 1588, he asked the Duke of Guise to call on him at the Château of Blois. As Guise entered the king's chamber, the king's bodyguard known as "the Forty-five" plunged their blades into his body, and he died at the foot of the king's bed. At the same moment, eight members of the Guise family were rounded up, including the Duke of Guise's brother, Louis II, Cardinal of Guise, whom Henry's men hacked to death the next day in the palace dungeons. Immediately after the murder of Guise, Henry entered Catherine's bedroom on the floor below and announced, "Please forgive me. Monsieur de Guise is dead. He will not be spoken of again. I have had him killed. I have done to him what he was going to do to me." Catherine's immediate reaction is not known; but on Christmas day, she told a friar, "Oh, wretched man! What has he done? …. Pray for him…. I see him rushing towards his ruin." She visited her old friend Cardinal de Bourbon on January 1, 1589 to tell him she was sure he would soon be freed. He shouted at her, "Your words, Madam, have led us all to this butchery." She left in tears. On January 5, 1589, Catherine died at the age of 59, probably from pleurisy. L'Estoile wrote: "those close to her believed that her life had been shortened by displeasure over her son's deed." He added that she had no sooner died than she was treated with as much consideration as a dead goat. Because Paris was held by enemies of the crown, Catherine had to be buried at Blois. Diane, daughter of Henry II and Philippa Duci, later had her body moved to Saint-Denis basilica. In 1793, a revolutionary mob tossed her bones into a mass grave with those of the other kings and queens. Eight months after Catherine's burial, a friar called Jacques Clément stabbed Henry III to death. At the time, Henry was besieging Paris with the King of Navarre, who succeeded him as Henry IV of France, ending nearly three centuries of Valois rule and bringing in the Bourbon dynasty. Catherine believed in the Renaissance humanist ideal of the learned Renaissance prince whose authority depended on letters as well as arms. She was inspired by the example of her father-in-law, King Francis I of France, who had hosted the leading artists of Europe at his court, and by her Medici ancestors. In an age of civil war and declining respect for the monarchy, she sought to bolster royal prestige through lavish cultural display. Once in control of the royal purse, she launched a programme of artistic patronage that lasted for three decades. During this time, she presided over a distinctive late French-Renaissance culture in all branches of the arts. An inventory drawn up at the Hôtel de la Reine after Catherine's death shows her to have been a keen collector. Listed works of art included tapestries, hand-drawn maps, sculptures, rich fabrics, ebony furniture inlaid with ivory, sets of china, and Limoges pottery. There were also hundreds of portraits, for which a vogue had developed during Catherine's lifetime. Many portraits in her collection were by Jean Clouet (1480–1541) and his son François Clouet (c. 1510–1572). François Clouet drew and painted portraits of all Catherine's family and of many members of the court. After Catherine's death, a decline in the quality of French portraiture set in. By 1610, the school patronized by the late Valois court and brought to its pinnacle by François Clouet had all but died out. Beyond portraiture, little is known about the painting at Catherine de' Medici's court. In the last two decades of her life, only two painters stand out as recognizable personalities: Jean Cousin the Younger (c. 1522–c. 1594), few of whose works survive, and Antoine Caron (c. 1521–1599), who became Catherine's official painter after working at Fontainebleau under Primaticcio. Caron's vivid Mannerism, with its love of ceremonial and its preoccupation with massacres, reflects the neurotic atmosphere of the French court during the Wars of Religion. The musical shows in particular allowed Catherine to express her creative gifts. They were usually dedicated to the ideal of peace in the realm and based on mythological themes. To create the necessary dramas, music, and scenic effects for these events, Catherine employed the leading artists and architects of the day. Historian Frances Yates has called her "a great creative artist in festivals." Catherine gradually introduced changes to the traditional entertainments: for example, she increased the prominence of dance in the shows that climaxed each series of entertainments. A distinctive new art form, the ballet de cour, emerged from these creative advances. Owing to its synthesis of dance, music, verse, and setting, the production of the Ballet Comique de la Reine in 1581 is regarded by scholars as the first authentic ballet. Catherine de' Medici's great love among the arts was architecture. "As the daughter of the Medici," suggests French art historian Jean-Pierre Babelon, "she was driven by a passion to build and a desire to leave great achievements behind her when she died." After Henry II's death, Catherine set out to immortalize her husband's memory and to enhance the grandeur of the Valois monarchy through a series of costly building projects. These included work on châteaux at Montceaux-en-Brie, Saint-Maur-des-Fossés, and Chenonceau. Catherine built two new palaces in Paris: the Tuileries and the Hôtel de la Reine. She was closely involved in the planning and supervising of all her architectural schemes. Catherine had emblems of her love and grief carved into the stonework of her buildings. Poets lauded her as the new Artemisia, after Artemisia II of Caria, who built the Mausoleum at Halicarnassus as a tomb for her dead husband. As the centerpiece of an ambitious new chapel, she commissioned a magnificent tomb for Henry at the basilica of Saint Denis. It was designed by Francesco Primaticcio (1504–1570), with sculpture by Germain Pilon (1528–1590). Art historian Henri Zerner has called this monument "the last and most brilliant of the royal tombs of the Renaissance." Catherine also commissioned Germain Pilon to carve the marble sculpture that contains Henry II's heart. A poem by Pierre de Ronsard, engraved on its base, tells the reader not to wonder that so small a vase can hold so large a heart, since Henry's real heart resides in Catherine's breast. Although Catherine spent ruinous sums on the arts, most of her patronage left no permanent legacy. The end of the Valois dynasty so soon after her death brought a change in priorities. Her art collections were dispersed, her palaces sold, and her buildings were left unfinished or later destroyed. Some recent historians have excused Catherine from blame for the worst excesses of the crown, though evidence for her ruthlessness can be found in her letters. In practice, her authority was always limited by the effects of the civil wars, and she fought a losing battle for control of a kingdom lapsing into chaos. Her policies, therefore, may be seen as desperate measures to keep the Valois monarchy on the throne at all costs, and her spectacular patronage of the arts as an attempt to glorify a monarchy whose prestige was in steep decline. Without Catherine, it is arguable that her sons would never have survived in power. The years in which they reigned have been called "the age of Catherine de' Medici". Catherine de' Medici married Henry, Duke of Orléans, the future Henry II of France, in Marseille on October 28, 1533. She gave birth to ten children, seven of whom survived to adulthood. Her three oldest sons became king of France; two of her daughters married kings; and one married a duke. Catherine outlived all her children except Henry III, who died seven months after her, and Marguerite, who inherited her robust health. Francis II, King of France (January 19, 1544 – December 5, 1560). Married Mary, Queen of Scots, in 1558. Elizabeth, Queen consort of Spain (April 2, 1545 – October 3, 1568). Married Philip II, King of Spain, in 1559. Claude, Duchess consort of Lorraine (November 12, 1547 – February 21, 1575). Married Charles III, Duke of Lorraine. Louis, Duke of Orleans (February 3, 1549 – October 24, 1549). Died in infancy. Charles IX, King of France (June 27, 1550 – May 30, 1574). Married Elizabeth of Austria in 1570. Henry III, King of France (September 19, 1551 – August 2, 1589). Married Louise of Lorraine in 1575. Marguerite, Queen consort of France and Navarre (May 14, 1553 – March 27, 1615). Married Henry, King of Navarre, the future Henry IV of France, in 1572. François, Duke of Anjou (March 18, 1555 – June 19, 1584). Victoria (June 24, 1556 – June 24, 1556). Twin of Joan. Died at birth. Joan (June 24, 1556 – August 1556). Twin of Victoria. Died in infancy. ↑ R. J. Knecht. Catherine de' Medici. (London and New York: Longman, 1998. ISBN 0582082412), 272. ↑ 3.0 3.1 Leonie Frieda. Catherine de Medici. (London: Phoenix, 2005. ISBN 0173820390), 35. ↑ Knecht, Catherine de' Medici, 8. ↑ Knecht, Catherine de' Medici, 11. ↑ Frieda, 31; Knecht, Catherine de' Medici, 14. ↑ 14.0 14.1 Frieda, 53; Knecht, Catherine de' Medici, 16. ↑ Knecht, Catherine de' Medici, 29–30. Henry legitimized the child under the name Diane de France; he also produced at least two sons by other women. ↑ Frieda, 60, 95; Jean Heritier. Catherine de' Medici, translated by Charlotte Haldane. (London: George Allen and Unwin, 1963), 38–42. ↑ T. A. Morris. Europe and England in the Sixteenth Century. (London and New York: Routledge, 1998. ISBN 041515040X), 247; Frieda, 80. ↑ Andrew Pettegree. Europe in the Sixteenth Century. (Oxford: Blackwell, 2002. ISBN 063120704X), 154. ↑ John Guy. My Heart is my Own: The Life of Mary Queen of Scots. (London: Fourth Estate, 2004. ISBN 084115752X), 102–103. ↑ T. A. Morris. Europe and England in the Sixteenth Century. (London and New York: Routledge, 1998. ISBN 041515040X), 248. ↑ Knecht, Catherine de' Medici, 64; Mack P. Holt. The French Wars of Religion, 1562–1629. (Cambridge: Cambridge University Press, 2005. ISBN 0521547504), 44. The incident was known later as the "tumult" or conspiracy of Amboise. ↑ Nicola Mary Sutherland. Catherine de Medici and the Ancien Régime. (London: Historical Association, 1966), 32. ↑ Pettegree, 154; Margriet Hoogvliet, "Princely Culture and Catherine de Médicis." in Princes and Princely Culture, 1450-1650, edited by Martin Gosman, Alasdair A. MacDonald, and Arie Johan Vanderjagt. (Leiden and Boston, MA: Brill Academic, 2003. ISBN 9004135723), 105. The regency was traditionally the preserve of the princes of the blood. ↑ Scott Michael Manetsch. Theodore Beza and the Quest for Peace in France, 1572-1598. (Leiden and Boston, MA: Brill Academic, 2000. ISBN 9004111018), 22. ↑ Knecht, Renaissance France, 311; Sutherland, Ancien Régime, 11–12. The edict, also known as the Edict of Toleration and the Edict of January, was significant for effectively recognizing the existence of Protestant churches and permitting their worship outside city walls. ↑ Nicola Mary Sutherland. The French Secretaries of State in the Age of Catherine de Medici. (London: Athlone Press, 1962), 140. ↑ Frieda, 191. The rebels signed the Treaty of Hampton Court with Elizabeth of England, giving her Le Havre (to be exchanged later for Calais), in return for her support. ↑ Frieda, 192–193. His wife, Jeanne d'Albret, remained queen regnant of Navarre; and her eight-year-old son Henry became First Prince of the Blood. ↑ James B. Wood. The King's Army: Warfare, Soldiers and Society during the Wars of Religion in France, 1562–76. (Cambridge: Cambridge University Press, 1996. ISBN 0521550033), 17. ↑ Jeanne d'Albret wrote to her son, Henry: "I am not free to talk with either the King or Madame, only the Queen Mother, who goads me [me traite á la fourche] …. You have doubtless realized that their main object, my son, is to separate you from God, and from me." Quoted by Knecht, Catherine de' Medici, 148–149. ↑ Nicola Mary Sutherland. The Massacre of St Bartholomew and the European Conflict, 1559–1572. (London: Macmillan, 1973. ISBN 333136292), 313. ↑ Frieda, 254, 304–305; Holt, 83. The investigators traced the house and horse to the Guises and claimed to have found evidence that the would-be killer was Charles de Louviers de Maurevert. ↑ Knecht, Catherine de' Medici, 154–157. Coligny was lobbying the king to intervene against the empire in the Netherlands. • For an overview of historians' various interpretations, see Holt, 83–84. • Marshal Tavannes recalled that Catherine had summoned a war council in the Tuileries Gardens (so as not to be overheard) to plan the next move: "Because the attempt on the Admiral would cause a war, she, and the rest of us, agreed that it would be advisable to bring battle in Paris." It is almost certain, however, that when Charles gave the order "Kill them all!," he meant those drawn up on a list by Catherine, and not, as has often been claimed, all Huguenots. Frieda, 306–308. ↑ Knecht, Catherine de' Medici, 162. ↑ Knecht, Catherine de' Medici, 163–164; Heller, 117; Manetsch, 60–61. The misogyny and anti-Italianism in Huguenot "histories" proved seductive not only to Protestants but to Catholics seeking a scapegoat for France's woes. ↑ Holt, 105–6; Knecht, Catherine de' Medici, 186; Frieda, 384–387. ↑ Knecht, Catherine de' Medici, 212–213; Frieda, 406–407. ↑ "The Day of the Barricades," as the revolt became known, "reduced the authority and prestige of the monarchy to its lowest ebb for a century and a half." Morris, 260. ↑ Henry wrote a note to Villeroy, which began: "Villeroy, I remain very well contented with your service; do not fail however to go away to your house where you will stay until I send for you; do not seek the reason for this my letter, but obey me." Sutherland, Secretaries of State, 300–303. ↑ Knecht, Catherine de' Medici, 264–265. ↑ 137.0 137.1 Knecht, Catherine de' Medici, 267. ↑ 138.0 138.1 Knecht, Catherine de' Medici, 268–269. ↑ Pierre de Bourdeille Brantôme. Illustrious Dames of the Court of the Valois Kings, translated by Katharine Prescott Wormeley. (New York: Lamb, 1912), 88. ↑ Dimier, 308–319; Jollet, 17–18. ↑ Anthony Blunt. Art and Architecture in France: 1500–1700. (New Haven: Yale University Press, 1999. ISBN 0300077483), 98. ↑ Blunt calls Caron's style "perhaps the purest known type of Mannerism in its elegant form, appropriate to an exquisite but neurotic society." Blunt, 98, 100. ↑ Frances Yates. The Valois Tapestries. (1959) (London: Routledge & Kegan Paul, 1999. ISBN 0415220432), 68. ↑ Yates, 51; Roy Strong. Art and Power: Renaissance Festivals, 1450–1650. (Woodbridge, UK: Boydell Press, 1984. ISBN 0851152473), 102, 121–122. ↑ Carol Lee. Ballet in Western Culture: A History of Its Origins and Evolution. (London: Routledge, 2002. ISBN 041594256X), 44. ↑ Jean-Pierre Babelon, "The Louvre: Royal Residence and Temple of the Arts." Realms of Memory: The Construction of the French Past. Vol. III: Symbols, edited by Pierre Nora. (English language edition translated by Arthur Goldhammer, edited by Lawrence D. Kritzman. New York: Columbia University Press, 1998. ISBN 0231109261), 263. ↑ David Thomson, Renaissance Paris: Architecture and Growth, 1475-1600.. (Berkeley: University of California Press, 1984. ISBN 0520053478). Retrieved 21 March 2008., 168. ↑ Thomson, 97; Sutherland, Ancien Régime, 3; Neale, The Age of Catherine de Medici. ↑ Heritier, 48; Frieda, 69, has the twins' deaths the other way round. Babelon, Jean-Pierre. "The Louvre: Royal Residence and Temple of the Arts." Realms of Memory: The Construction of the French Past. Vol. III: Symbols, edited by Pierre Nora. English language edition translated by Arthur Goldhammer, edited by Lawrence D. Kritzman. New York: Columbia University Press, 1998. ISBN 0231109261. Blunt, Anthony. Art and Architecture in France: 1500–1700. New Haven: Yale University Press, 1999. ISBN 0300077483. Brantôme, Pierre de Bourdeille. Illustrious Dames of the Court of the Valois Kings, translated by Katharine Prescott Wormeley. New York: Lamb, 1912. OCLC 347527. Carroll, Stuart. Noble Power During the French Wars of Religion: The Guise Affinity and the Catholic Cause in Normandy. Cambridge University Press, 2005. ISBN 0521023874. Dimier, L. French Painting in the XVI Century, translated by Harold Child. London: Duckworth, 1904. Guy, John. My Heart is my Own: The Life of Mary Queen of Scots. London: Fourth Estate, 2004. ISBN 084115752X. Hearn, Karen, ed. Dynasties: Painting in Tudor and Jacobean England, 1530-1630. New York: Rizzoli, 1995. ISBN 084781940X. Heller, Henry. Anti-Italianism in Sixteenth-century France. Toronto: University of Toronto Press, 2003. ISBN 0802036899. Heritier, Jean. Catherine de' Medici, translated by Charlotte Haldane. London: George Allen and Unwin, 1963. Holt, Mack P. The French Wars of Religion, 1562–1629. Cambridge: Cambridge University Press, 2005. ISBN 0521547504. Hoogvliet, Margriet. "Princely Culture and Catherine de Médicis." in Princes and Princely Culture, 1450-1650, edited by Martin Gosman, Alasdair A. MacDonald, and Arie Johan Vanderjagt. Leiden and Boston, MA: Brill Academic, 2003. ISBN 9004135723. Jollet, Etienne. Jean et François Clouet, translated by Deke Dusinberre. Paris: Lagune, 1997. ISBN 0500974659. __________. The Rise and Fall of Renaissance France, 1483-1610. Oxford: Blackwell, 2001. ISBN 0631227296. Lee, Carol. Ballet in Western Culture: A History of Its Origins and Evolution. London: Routledge, 2002. ISBN 041594256X. Manetsch, Scott Michael. Theodore Beza and the Quest for Peace in France, 1572-1598. Leiden and Boston, MA: Brill Academic, 2000. ISBN 9004111018. Morris, T. A. Europe and England in the Sixteenth Century. London and New York: Routledge, 1998. ISBN 041515040X. Strong, Roy. Art and Power: Renaissance Festivals, 1450–1650. Woodbridge, UK: Boydell Press, 1984. ISBN 0851152473. Sutherland, Nicola Mary. Catherine de Medici and the Ancien Régime. London: Historical Association, 1966. __________. The Massacre of St Bartholomew and the European Conflict, 1559–1572. London: Macmillan, 1973. ISBN 333136292. __________. Princes, Politics and Religion: 1547–1589. London: Hambledon Press, 1984. ISBN 0907628443. Thomson, David. Renaissance Paris: Architecture and Growth, 1475-1600. Berkeley: University of California Press, 1984. ISBN 0520053478. Retrieved 21 March 2008. Tomas, Natalie R. The Medici Women: Gender and Power in Renaissance Florence. Aldershot, UK: Ashgate, 2003. ISBN 0754607771. Wilson, Ian. Nostradamus: The Evidence. London: Orion, 2003. ISBN 075284279X. Wood, James B. The King's Army: Warfare, Soldiers and Society during the Wars of Religion in France, 1562–76. Cambridge: Cambridge University Press, 1996. ISBN 0521550033. Yates, Frances. The Valois Tapestries. (1959) London: Routledge & Kegan Paul, 1999. ISBN 0415220432. Zerner, Henri. Renaissance Art in France. The Invention of Classicism, translated by Deke Dusinberre, Scott Wilson, and Rachel Zerner. Paris: Flammarion, 2003. ISBN 2080111442. (French) Zvereva, Alexandra. Les Clouet de Catherine de Médicis. Paris: Somogy, Éditions d'Art; Musée Condé, Château de Chantilly, 2002. ISBN 2850565709. Memoirs of Marguerite de Valois Full text at Gutenberg. History of "Catherine de' Medici"
This page was last modified on 19 January 2017, at 16:25.